New "Collections" feature targets consumers with pin board concept. As the New York City real estate industry spars with listings aggregator StreetEasy, brokerage unicorn Compass is unveiling a new consumer-facing feature that gives apartment hunters an alternative to the popular listings website. In effect, Compass wants to build the Pinterest of real estate. 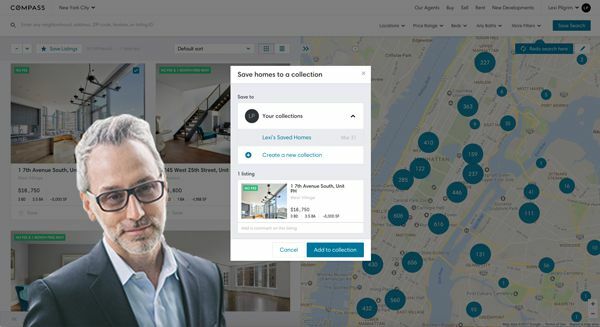 Its new feature, known as “Collections,” allows consumers to create their own version of the Pinterest pin board for properties they’re interested in, said Leonard Steinberg, president of the firm. Homebuyers and their agents can organize the properties they’re eyeing in one place and discuss them via a commenting tool. They can also share availability and pricing changes on the board and invite friends and family to weigh in on apartments by posting their opinions on each listing. In some ways, the Collections feature is the first major public test of Compass’ tech chops. While much of the 1,400-agent company’s reported $1 billion-plus value is said to lie in its technology, most of those offerings have been agent-facing thus far. The brokerage also hopes the feature will become a strong marketing tool, since agents can create public boards to share with potential clients and on social media. Steinberg said the feature does not directly compete with StreetEasy — which has drawn the ire of the brokerage community with its “premier agent” feature — but it’s certainly an alternative way to shop for real estate. “Shoppers are always going to look to StreetEasy,” he said.